We have systems that track fund manager movements. As a private investor you can track fund managers through their monthly or quarterly investment fund reports available on their websites. Almost all fund managers provide these monthly reports on their funds. 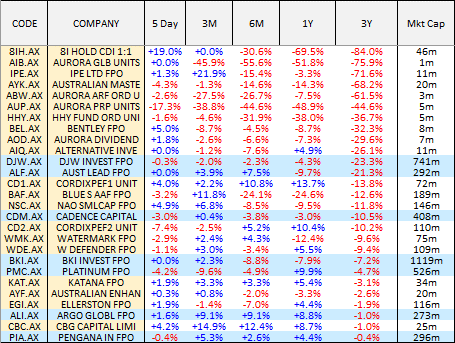 These almost always contain details of their top twenty holdings and if you compare one month to the next you can maybe work out whether they are buying or selling. Again professionals track fund managers through expensive systems and subscriptions. Fund Manager movements are a great resource for stock pickers, seeing what the big money is doing in the little stocks is essential knowledge. Watching what the fund managers are up to is an insight into their research and their research is done by people with more time, resources and experience than you. When they earn millions of dollars a year they can afford to dedicate significantly more dollars to the stock picking task than you do. 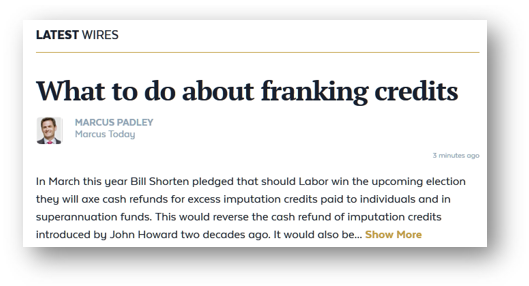 So why not pay attention to what they do, and in so-doing piggyback their $200,000 (plus) analysts. I have a member who uses fund manager reports as his primary resource, constantly checking what top fund managers are picking and selling and using their insights and ideas to prompt his own ideas and research. He claims a persistent performance of the market over years by sorting the best performing fund managers once a year and putting money into their funds, adjusting once a year. All of us in the funds management game develop a list of fund managers to follow. Fund managers that are either really good, or really big. You also need to follow the big ones because they move prices, whether they perform well or not. 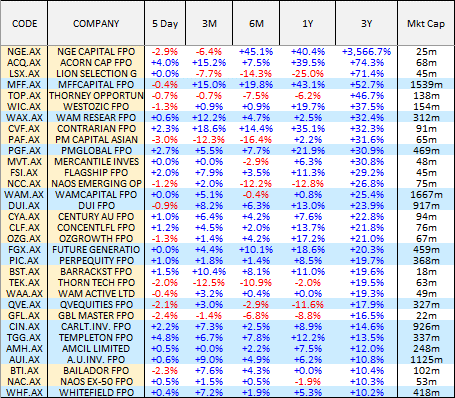 Wilson Asset Management for instance runs around two billion dollars and hold a lot of small and midcap industrials. They move prices. One of the misconceptions about small and mid-cap stocks is that because it is small and mid-cap investing, it is short term or trading. Not the case. Most of those small and mid-cap fund managers, by virtue of the size of holding they need to buy to have any influence over performance, have to be long-term, because they simply don’t have the liquidity to get in and out. Net result you have $200,000 plus analysts analysing an area of the market with the most potential for performance and coming to conclusions which are designed to persist over years rather than days weeks or months. They are worth watching. WHICH FUND MANAGERS ARE THE BEST? 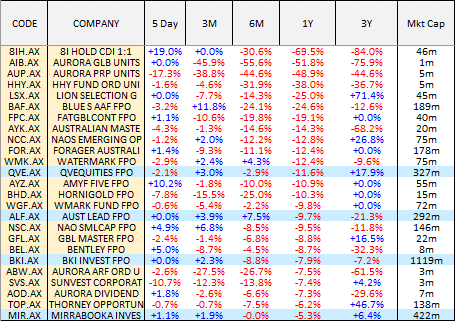 Here on the other hand are LICs or Listed Investment Companies which are managed funds listed on the ASX which you can buy and sell just the same as a share. These are listed in market capitalisation order. This is a list of the best performing LICs in the last year. This is simply showing the performance of the share price not the performance of the fund but the two are very highly correlated – LICs can trade at a premium or discount to the value of the fund. 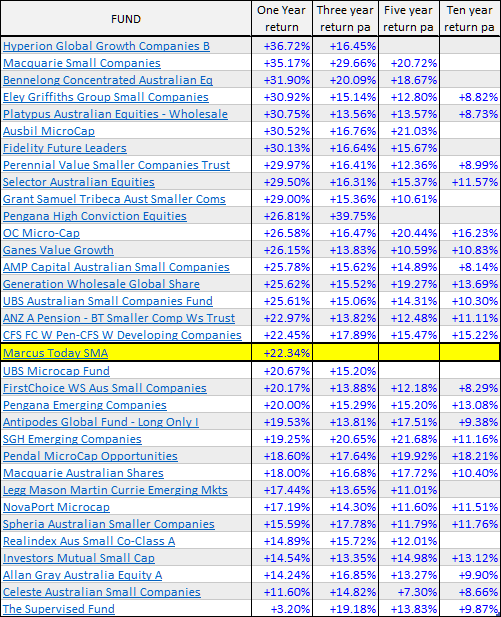 I have highlighted in blue the larger funds that are over $200 million in market capitalisation. 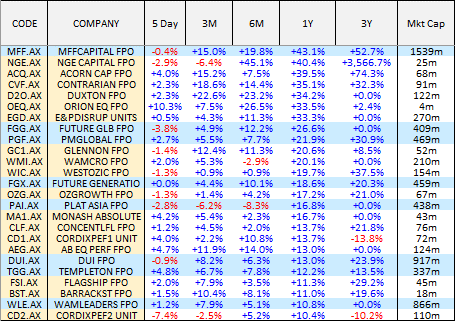 This is a list of the worst performing LICs over the last year. 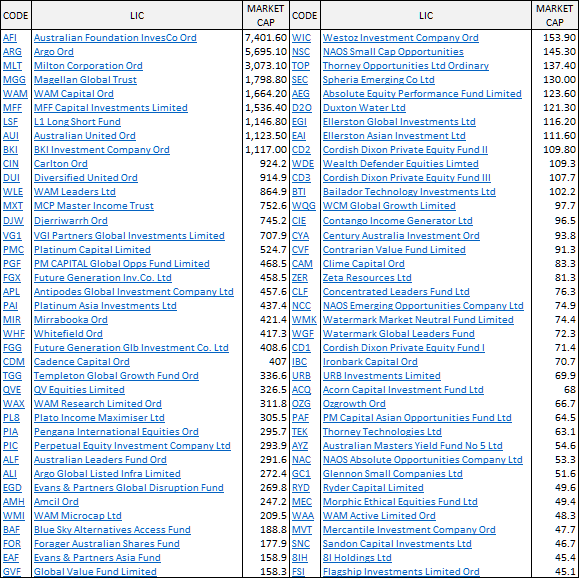 More relevant is the longer term performance – here is a list of the best performing LICs in the last three years – these are not returns per annum this is simply the rise or fall of the share price of the LIC over the last three years. These are the worst performing LIC share prices over the last three years.